When I lived in Lima, going to the university there, I often sat alone with a notebook. I'd sit and observe students as they got their snacks in the Student Union Cafe or walking across the college quad and make up stories about them. I pretended like I knew them, as if we shared another alternate world where I knew each of them by name. I knew their secrets, their hopes and dreams, what they were thinking or worrying about. They became characters to me. One girl with her backpack and holding a stack of books while trying to balance her coffee...or a boy walking with his friends to class...or a professor on his cellphone...they were all part of this imaginary world I invented. I did this because I didn't really know a lot of people and I wasn't in the right place in my life to get to know new people. I wasn't ready. I had moved to Lima at my father's request so that I could learn a new life. A life that didn't involve my now-husband and the life I had in California that was going no where fast. I was given a round-trip ticket to Lima just to spend the summer with family which, upon arrival, turned into a one-way ticket. The only way I could come back to California would be to get my life together and bring a paper to my father that said I had mastered a trade or had received a diploma of some sort. It sounds cruel and I did think so at the time, sometimes still do, but I think sometimes a parent has to do what a parent has to do. I left Lima two years later with a certificate from a bilingual secretarial school. Returning to California, I landed a job and have been working ever since. So, there was some good in that trip. Not just having learned some good skills and lots of life lessons, but mostly I learned that I could be myself in a new world (to me) and that I was a writer. I know I became a writer in my teenage years, but coming back from Lima with notebooks upon notebooks filled with stories and thoughts solidified that idea of what my real passion was. Writing, reading, and anything to do with the written word makes me complete. Not a day passes when I don't either write here, have my nose in a book, or I'm looking up inspirational quotes and writing. 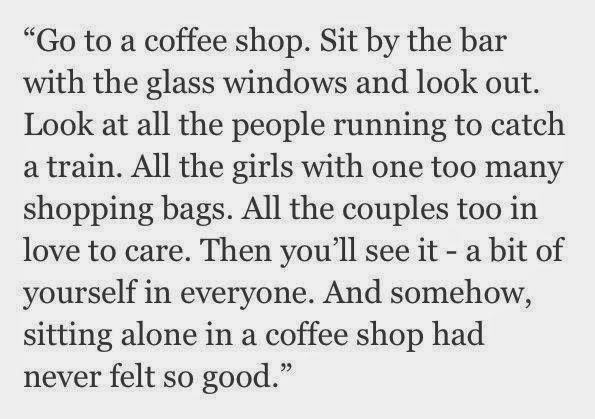 I think I'd like to sit at a coffee shop one day, again. Relive those Peruvian afternoons, people-watching, and making stories out of a passersby's life.